By Charles H. Behre, Jr.
Volcanic rocks are used as building stones in many parts of the western United States, notably in Idaho, Arizona, New Mexico, Nevada, and California, and for centuries they have found a similar use in Mexico. In central Idaho volcanic rocks and the associated sedimentary and igneous rocks are widely distributed and have been quarried sporadically. Their widespread occurrence and the occasional local demand appear to justify a brief notice of their distribution and use. Central Idaho is a relatively rugged and still very difficultly accessible country, thinly settled and lacking extensive industries other than stock raising, farming, and mining. There are few towns and no large cities. Railroads are widely separated and must be supplemented by truck haulage. Owing to these conditions there is only a small amount of building, and the demand for suitable structural material is correspondingly meager. For most purposes lumber, which is generally plentiful, suffices. Nevertheless, for use in the larger dwellings, in such buildings as stores and banks, and particularly in municipal structures like town halls and schools, there is some call for building stone. In 1913 a summary of the occurrences of building stone in Idaho was published. Since then a few new sources have been studied, and these are described in this report. They comprise Tertiary lavas, tuffs, and "lake beds" of the upper valley of the Salmon river in Custer and Lemhi Counties. 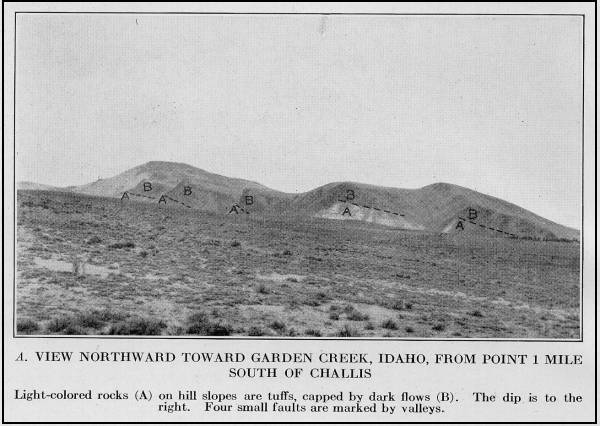 The field work upon which this account is based included four days of reconnaissance incidental to areal geologic mapping near Salmon and Challis and several brief examinations along the roads in this region during August, 1926. Figure 28. 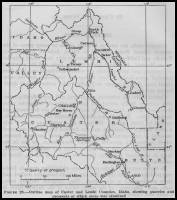 - Outline map of Custer and Lemhi Counties, Idaho, showing quarries and prospects at which stone was examined. The region is one of great relief, with rugged mountains and generally narrow intermontane valleys. The valley of the Salmon River, however, is relatively broad, and its floor through a large part of the course in these counties supports farming on a moderate scale. The main stream rises in the Sawtooth Range, chiefly west and southwest of Stanley. Thence the Salmon flows eastward for about 35 miles. Near Clayton it is joined by the waters of the East Fork, and the course turns until it is generally somewhat east of north for about 75 miles, passing successively Challis, Ellis, Salmon ( at the mouth of the Lemhi River), Carmen, and Shoup. The places mentioned are the only ones of noteworthy size along the valley of the Salmon River. Carmen and Shoup are settlements with scarcely a dozen houses apiece. Stanley and Clayton, each with about 150 inhabitants, are chiefly supply centers for the small farms of the valley and the few mines in the surrounding mountains. Challis, the county seat of Custer County, with 484 inhabitants in 1920, is a trading center. Salmon, the county seat of Lemhi County, is the largest town in the valley, numbering 1,311 people in 1920. It is the terminus of the Gilmore & Pittsburgh Railroad, which connects with the Oregon Short Line at Armstead, Mont. The State highway from the Snake River Plain passes through Mackay, the terminus of a branch of the Oregon Short Line, to Challis and thence to Salmon. A road from Hailey and Ketchum, which are on another branch railroad, joins the highway near Challis, and other roads in Lemhi and Pahsimeroi Valleys connect the region near Salmon with the eastern part of the Snake River Plain. There are a few branch roads in addition to those mentioned, but much of the region is reached only by trails. The geology of the area has been described in several publications. The earlier rocks range in age from pre-Cambrian to Mississippian and are greatly folded and faulted and highly metamorphosed. They have been intruded by granitic rocks of Cretaceous or early Tertiary age. These older rocks are unconformably overlain by Tertiary flows and tuffs and associated sandstones, which are broadly arched and broken by numerous faults. (See pl. 52. ) They are roughly divisible into three groups - a lower one consisting largely of lava flows which vary in composition from basalts to rhyolites; a middle group called "lake beds" in earlier literature and composed mainly of stratified volcanic ash, tuff, and sandstone, with a few lava flows; and an upper group of rhyolitic flows with some associated tuffs. As no complete section has yet been measured, the aggregate thickness of these Tertiary rocks is not known. They range in age from Oligocene to Pliocene. After the deposition and partial removal by erosion of the Tertiary rocks, probably during Pleistocene and later time, parts of the valleys were filled with alluvial materials, which have since been eroded in places. These appear in high-level terraces of coarse gravel and sand. Almost all available kinds of rocks are used as building materials in this region, but on account of the difficulty of working and trimming, the "granites" and pre-tertiary sediments are far less in demand for cut stone than the Tertiary rocks. Therefore only the Tertiary rocks are here discussed in detail. Varieties of building stones of Tertiary age. - The varieties of Tertiary rocks used for building are sandstone, tuff, and lava. A part of this sequence was laid down like most ordinary sediments, in large bodies of standing water. The streams flowing into these basins brought sand; at the same time near-by volcanic eruptions furnished fine or coarse fragments of lava, which taken collectively are called volcanic ash or tuff, and which, settling through the water, formed layers that alternated with the sand brought in by the streams. As the proportion of rounded quarts grains or sand to angular fragments of volcanic ash varies in different strata, doubt always exists as to whether any individual bed should be called volcanic ash or sandstone. As the characteristic feature of the "lake beds" is the dominance of sand, and as the proportion of sand to volcanic ash is highly variable even in a single stratum, it is clear that the distinction between "lake beds" and the Tertiary volcanic clastic deposits is not easily drawn. In the absence of detailed geologic mapping, therefore, it is best, both practically and theoretically, to consider all the Tertiary rocks as a geologic unit and to describe their distribution collectively. Distribution of Tertiary rocks. - The distribution of the Tertiary rocks is irregular and has not yet been mapped in any detail. Exposures of the so-called "lake beds" with minor amounts of lava are continuous along the Salmon River from a point about 11 miles below Salmon to a point somewhat more that 7 miles above Salmon. Lava borders the "lake beds," especially on the west, from the vicinity of Salmon southward. 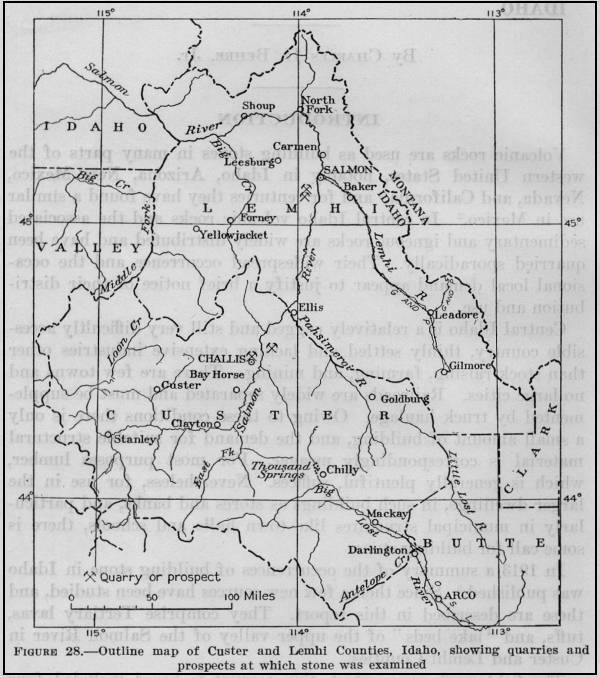 Similar "lake beds" and lava in the valley of the Lemhi River have been described and mapped by Umpleby and by Ross. South of the southern terminus of this area of "lake beds," along the Salmon River, lava is exposed for a few miles, followed upstream by a strip of quartzite for 8 miles more. From this point to a point about 10 miles below Challis exposures of quartzite and of lava with some tuff alternate, but the Tertiary strata cover most of the valley sides. Farther upstream there are more such rocks, and Tertiary sandstone and tuff are especially prominent along with river near the mouth of its East Fork almost to the head of the main river very few Tertiary strata are exposed. Sandstone. - A variable thickness of the "lake beds" in the Salmon River Valley is made up of sandstone. Near the town of Salmon this rock is especially conspicuous. 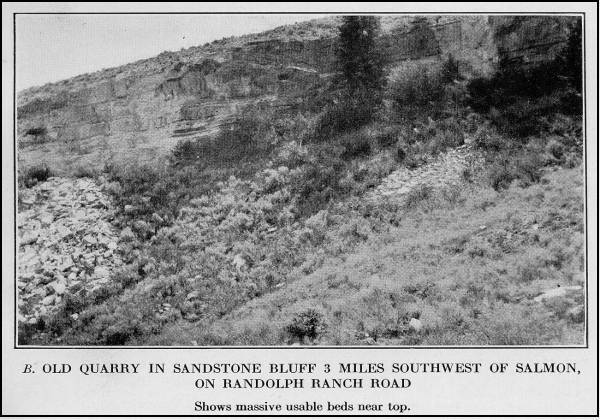 Here, in the bluffs above the river, is a series of variegated sandstones, partly arkosic, interbedded with tuff; the thickness of the entire section is about 700 feet. The sandstones are pink, buff, gray, cream-colored, or white, with slight rusting along fissures and exposed faces. Beds 8 feet thick occur but are rare, and the average is about 3 feet. Cross-bedding can be seen in a few places. The rock is not well cemented and is somewhat crumbly but hardens slightly after seasoning. It parts readily along the bedding planes, though it is not conspicuously laminated. Fracturing approximately at right angles to the bedding is common but lacks regularity and therefore can not be turned to advantage in systematic quarrying. Under the microscope the individual grains are seen to be chiefly angular or only slightly rounded. They consist dominantly of quartz, with relatively small quantities of biotite and muscovite mica flakes and of virtually fresh grains of plagioclase (soda-lime feldspar). The matrix consists of very small flakes and needles of muscovite, set in cloudy masses of one of the clay minerals, possibly beidellite or montmorillonite. Both matrix and grains are discolored with red iron oxide, especially in the pinkish rock. Some beds contain no muscovite. There are two localities where such sandstone has been worked. One of these is 3 miles southwest of the bridge across the Salmon River at Salmon, on the road toward the Randolph ranch, in secs. 11 and 12, T. 21 N., R. 21 E. Here a working face has been cut into a cliff (pl. 51, B ), and the rock has been quarried on a small scale. The general strike is N. 30º E., and the dip is 15º SE. Plate 51. B. Old quarry in Sandstone Bluff 3 miles southwest of Salmon, on Randolph Ranch Road. Shows massive usable beds near top. Section 3 miles southwest of Salmon. Beneath this measured section are irregular thin beds of tuff and sandstone, largely covered with rubble. Many of the beds contain noteworthy amounts of volcanic material. It is the pinkish, thicker beds near the base of this section that have furnished most of the building stone. A second quarry about three-quarters of a mile farther south along the same road is a cut 80 by 60 feet in area, with a maximum depth of 15 feet. The road is about 80 feet from the face. The rock in the lower 3 feet is massive, but the upper part is thin bedded. The general color is light gray. Under the microscope the rock is seen to consist largely of medium-sized quartz grains, mica (both greenish and white, about a third as abundant as the quartz), and the minor quantities of plagioclase. The cement between these grains consists of iron oxide, a clay mineral, and fine flakes of white mica. Plate 51. 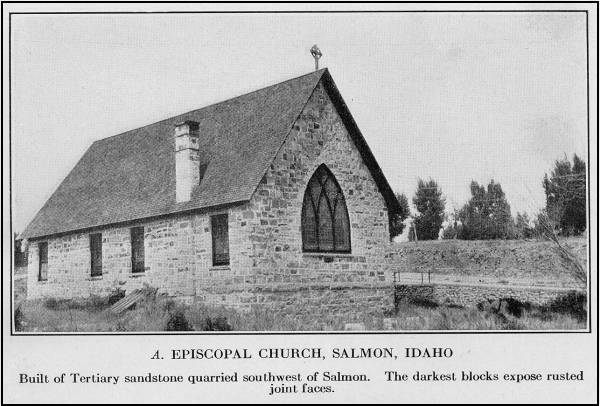 A. Episcopal Church, Salmon, Idaho. Built of Tertiary sandstone quarried southwest of Salmon. The darkest blocks expose rusted joint faces. "Ordinarily in using either sandstone or tuff for outside walls of buildings a 3-inch space is left between stone and interior plaster to permit air circulation and keep the plaster relatively dry. Tuff. - Although there are many eruptive rocks in the neighborhood of Salmon, the sandstones described are preferred as building material; but at Challis and Clayton, in the absence of sandstone, the tuff and lava are more extensively used. Tuff in acceptable quantity and quality is found on the north side of Garden Creek, within the town of Challis. (See pl. 52. ) There are large exposures of similar rock on the east side of the Salmon at Beardsley Hot Springs, opposite Challis, and intermittent occurrences upstream almost as far as Clayton. Some of the last-named probably also include sandstone. In many of these places the tuff is capped by lava which would have to be removed in quarrying. A total thickness of about 1,000 feet of tuff, sandy layers, and some lava, cut by small faults and by numerous irregular joint planes, is well exposed on the east bank of the Salmon River immediately north of Beardsley Hot Springs. Plate 52. A. View northward toward Garden Creek, Idaho, from point 1 mile south of Challis. Light-colored rocks (A) on hill slopes are tuffs, capped by dark flows (B). The dip is to the right. Four small faults are marked by valleys. Plate 52. B. View across Garden Creek at Challis. Light-colored tuffs are covered by dark rhyolite with columnar jointing. Section on Garden Creek at Challis. Several small faults cut across the beds, striking generally north and dropping the west side. Roughly 800 feet north of Challis post office a quarry has been opened about midway in this section; it exposes the 62 feet of light-colored tuff mentioned above, along a face 90 feet long. The rock is cut by two sets of approximately vertical joints, and many of the fractures are very closely spaced. To the unaided eye the rock seems to consist of a fine-grained groundmass with a few small specks of black mica. Under the microscope it shows fragments of feldspar (oligoclase-albite), and a little quartz and black mica. Scattered shreds of hornblend are visible, and locally there are fibrous areas of a mineral with very low birefringence, probably chlorite. Some very cloudy patches suggest greatly altered orthoclase. The altered orthoclase and the oligoclase-albite would both weather rapidly when wet, but in so dry a country as this none of the minerals constituting the rock detract from its adaptability as a building stone, and actual use in this region shows that the stone does not weather seriously under the local climatic conditions. It has been demonstrated that rocks containing noticeable quantities of clay minerals are not well suited for many structural uses. The effect of these minerals is to induce a gradual swelling and spalling of the rock when moistened, with consequent weakening. 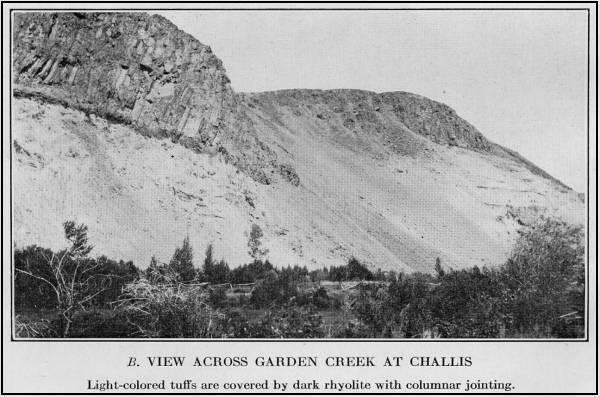 For this reason C. S. Ross, of the United States Geological Survey, and the writer made a careful examination of the tuff at Challis; it was found that the rock has a clayey odor and contains masses which under the microscope are dense and cloudy and are evidently a clay mineral of the montmorillonite group, although it is not possible to determine specifically which clay mineral they represent. Hence special precautions should be taken if use in foundations is contemplated (see pl. 53, B ); spalling may be avoided if the stone is coated with cement mortar, as shown in Plate 53, A . At heights of 2 feet or more above ground there is no danger of spalling. Plate 53. 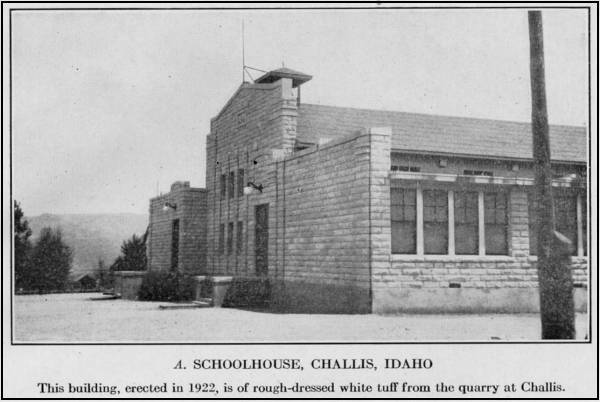 A. Schoolhouse, Challis, Idaho . This building, erected in 1922, is of rough-dressed white tuff from the quarry at Challis. Plate 53. B. 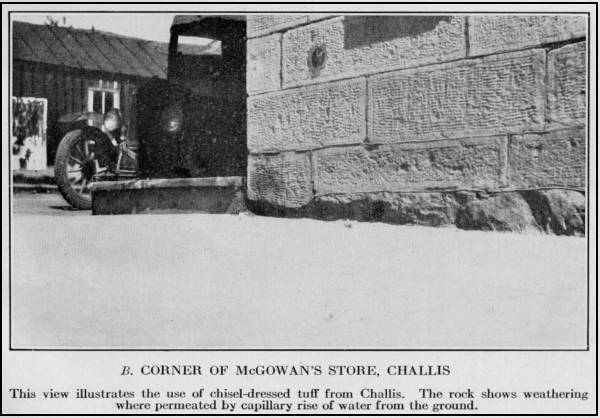 Corner of McGowan's Store, Challis. This view illustrates the use of chisel-dressed tuff from Challis. The rock shows weathering where permeated by capillary rise of water from the ground. The rock was also subjected to weathering tests. Four out of six specimens showed extensive disintegration upon 123 freezings, and the remaining two withstood 162 freezings with no recognizable change. All showed complete disintegration after having been frozen 355 times. The bureau concludes that this material is more resistant to weathering than some of the poorer grades of limestone now on the market. Comparative data on the strength of tuffs are scarce. The compressive strength of the tuff from Challis is about that of similar material from Lilliwaup, Wash., but the absorption ratio is greater. Merrill mentions a tuff in California which, though having a greater density, possesses a dry crushing strength of only 7,469 pounds to the square inch at right angles to the bedding. A comparison of the compressive strength of the tuff from Challis with that of several other building stones shows it to be as strong when dry as many limestones and sandstones, despite its low density. However, the limestones and sandstones exhibit no such noticeable decline in strength when wet; this reduction in strength is probably due to the presence of the clay mineral already mentioned. In and around Challis the local tuff has been used above the surface of the ground with much success. McGowan's store, the storehouse opposite, the Trealor and Nickerson residences, and the Challis school (see pl. 53, A ) were all built of this rock. All these buildings except the school have been standing for half a century. At Clayton also similar stone has proved satisfactory. Special considerations regarding the use of the tuff are discussed on pages 246-248. Lava flows. - The lavas that are associated with the Tertiary tuffs have also been used in building. They vary in color, but the groundmass is generally pinkish, near "salmon" or "old rose" when fresh; on the modified Ridgway color chart prepared by the Division of Geology and Geography of the National Research Council the color most generally shown would be approximately 92d. Weathered surfaces assume a rusty yellowish hue. A few of the flows are grayish, with faint olive-green tints, and suffer little color change on weathering. Many contain flow fragments in the lower parts. These rocks appear to be chiefly rhyolite, as determined by the unaided eye, but the relatively high ratios of plagioclase to orthoclase which they show under the microscope suggest that many are quartz latite. Along the north side of Garden Creek at Challis a reddish, pinkish, or light purplish-gray flow of rhyolite (quartz latite) caps the cliffs. (See pl. 52. ) It has been faulted in many places, so that, though it has a gentle dip, its height above stream level varies from place to place. Its total thickness is 35 to 50 feet but varies with the locality. The flow contains some shreds of deep pink, salmon, or very light pink glassy lava and locally is faintly banded with flow lines of chalcedonic silica. It is somewhat regularly fissured in two systems, one trending due east, and the other N. 20º E., and both vertical. Similar rock, probably a part of the same flow, is seen on the east bank of the Salmon River about two thirds of a mile below Beardsley Hot Springs. At Challis this lava presents to the unaided eye a pinkish groundmass bearing many phenocrysts of quartz and of light-colored glassy feldspar as much as 0.25 centimeter in diameter. Some kaolinized feldspar crystals are also present. Under the microscope numerous crystals of quartz and feldspar are visible, set in the reddish-brown groundmass, which is in part finely crystalline but chiefly glassy, with marked flow structure. The quartz phenocrysts show some fracturing. The feldspar is of two kinds - fresh albite and somewhat kaolinized orthoclase (?) - but the orthoclase is much the rarer. Accessories include rutile and magnetite, but no mica. The groundmass contains spherulitic patches in small quantity and some hematite-stained glass. The absence of pore space is striking. This lava has been utilized to a moderate extent for dwellings and small public buildings in Challis, especially for storage cellars, barns, and similar rough structures. Being only slightly porous, it makes a better foundation stone than the tuff previously described, but it is dressed with difficulty, and its relatively dark color militates against its use in building fronts. It has been obtained so far only from talus blocks on the slopes. It should not be difficult to quarry by undercutting. Buildings constructed of this stone include the city hall and the jail at Challis and parts of several residences. Near the mouth of Morgan Creek on the west side of Salmon-Challis highway, about 7 miles north of Challis, a light greenish-gray flow of quartz latite is exposed. The rock is of pleasing color and darkens but slightly on weathering, and at thickness of about 60 feet is available near the road; but much of the rock is closely jointed, almost platy, so that thick blocks suitable for building are rare. At Salmon the mean annual rainfall is only 9.31 inches and at Challis it is 7.31 inches. In the surrounding mountains it is much greater, but the chief use of the stones here considered is in the drier valleys. The rainfall is fairly evenly distributed, with the maximum in May and June. The annual temperature range is great - from 20° F. below zero in January to a little over 100° above zero in July, and the daily range in that part of the Salmon River Valley here discussed is 50° or 60° . There are rarely more than 100 successive days between severe frosts at Challis and Salmon. The precipitation is too low to be damaging to stone used above the capillary reach of water from the ground if the stone has been properly seasoned before use and especially it is well protected from direct rain by an overhanging roof. Hence the tuff of the Salmon Valley, despite its lightness and porosity, wears well under the local weather conditions. Furthermore, the capacity of a porous rock to resist freezing and weathering is in part indicated by the tendency toward complete saturation. The tuffs, despite their high porosity coefficients, show a markedly low saturation, and this lends resistance to disintegration by freezing. These statements probably apply equally as well to the tuffs and sandstones at Salmon as to the rock at Challis. Moreover, the absolute compressive strength of the tuff tested - a minimum of 4,000 pounds to the square inch, even when wet - is far in excess of local requirements. The kaolinized feldspar or the claylike minerals present in the rock might indeed weaken it locally and induce some spalling, thus injuring its appearance, but actual failure is unlikely in the uses to which the tuff and sandstone might be put in the small towns along the Salmon River. The strength of a stone under water depends upon its constituents and texture. A rough measure of its suitability is given by the ratio of its compressive strength when water saturated to its strength when dry. For the tuff from Challis tested by the Bureau of Standards this ratio is 0.37 - a low figure. For such uses as bridge piers or even house foundations, in a water-soaked subsoil, the tuffs near Challis would thus not be satisfactory. Indeed, this theoretical conclusion has already been confirmed by experience at Challis, and similar reasoning applies to the sandstone at Salmon. As a foundation stone, subject to the action of ground water, or for piering or shoring of any sort, the pink rhyolite or quartz latite that caps the tuffs at Challis is better than the tuff from Challis or the sandstone from Salmon, because it is less porous. Locally, as at the Monument mine, near Forney, rock of this type has been used in foundations for heavy machinery. It is not readily dressed, however; and is therefore less suited for fronts of buildings than the tuff; the color, too, is darker and less desirable. None of the rocks show heavy rusting on short exposure, though joint surfaces, apparently long exposed to oxidation, exhibit conspicuous brown staining. The assumption is therefore justified that they will not change color to any great extent as a result of the weathering that might be expected during the normal life of a building stone. In addition to their uses as building stone, the light-colored tuffs of this area are said to have found favor as furnace lining in lead smelting, and they may also well be utilized in chimneys and hearths and in the inner walls of dwellings. All the Tertiary rocks, and indeed those of pre-Tertiary age as well, are in demand here and there for road metal. The chief requirements for this purpose are nearness to the place of use and the presence of a sufficient quantity to justify quarrying. Harder rocks are preferred, and the tuffs are the least desirable.